» A Very Violent Christmas The Rev. Wil Gafney, Ph.D. Even without the litany of horrors that have made 2014 a year to forget if we could – hundreds of Nigerian girls abducted, sold and raped into slave marriages, their teachers and male classmates slaughtered, a plane with all souls aboard inconceivably disappeared into thin air, another plane from the same airline is shot down as Russia invaded and annexed Crimea – this Christmas is marked by violence the likes of which I have no comparison in my lifetime. The racist biases against black people in this country and individual internalization of that bias lead to the disparate treatment of black folk at the hands of police. Unarmed black people, including children in their beds are shot to death and armed white folk are not even checked to see if they are in compliance with Open Carry and other firearm laws while white cop-killers are brought in alive to stand trial. Too many black families are grieving the loss of their loved ones, many during these holidays and holy days. And many of us mourn with them, not as they mourn, but we mourn. And some of us are afraid for our brothers, sons, fathers, nephews and husbands. It is all too much. How can this be Christmas? What does Christmas have to say to our broken fearful hearts? I’ll tell you the truth, the promise of eternal life is not comforting right now, neither is forgiveness of sins. 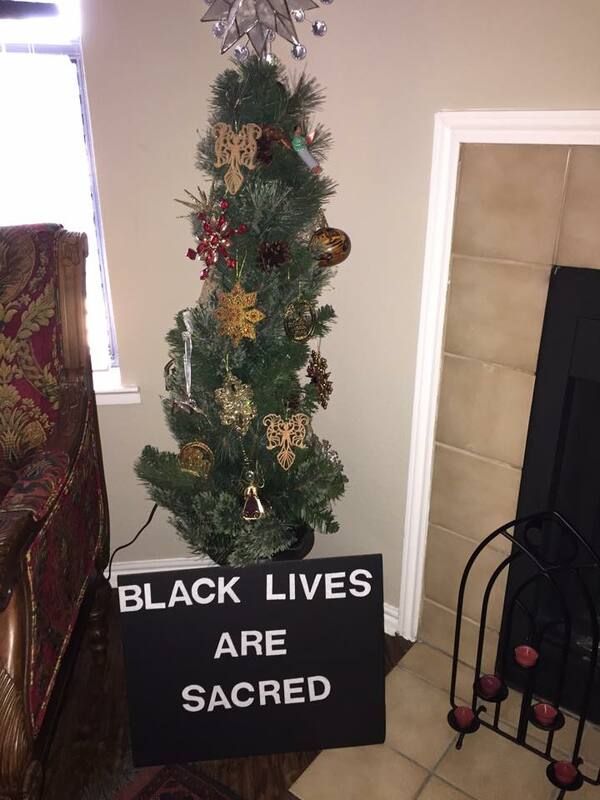 I want to know what Christmas has to do with, say to, say about black life being snuffed out in American streets with little consequence. There is one reason I haven’t thrown my bible against the wall and walked away long ago. One word actually. Immanu-El. God with us. God is with us. God is with us, dying in the street. That comforts me. Mahalia Jackson’s Sweet Little Jesus Boy is one of my favorite Christmas carols. It is a poignant articulation of how much the story of the poor Babe of Bethlehem has in common with that of the black person in racist America. It is decades old, originating in Jim Crow and still relevant. This Christmas I remember Jesus born to a fast-tailed girl and God was there, with her. Pregnant, single, presumed promiscuous. I remember a marginalized man, born into a world in which his people were subject to brutality at the whim of the people who oppressed his people. And God was with them. I remember a man who didn’t stick around for long eventually leaving a single mother to manage on her own, but God was with her. I remember a man whose protests against the powers of this world, including the collusion of some of his own folk led to death row. I remember a sorrowful mother told in his infancy that she would feel pain like being stabbed in the heart because of what the world would do to her child. And God remained with her. Even when the state executed her child and placed his bloody corpse in her arms. The violence of this Christmas season is not new. It is not new for African Americans who survived the Maafa, slavocracy, Jim and Jane Crow, state-supported lynchings, the prison industrial complex. We have survived because God has been with us. It is not new in the history of the world. We will survive trigger-happy police trained by their fear and society’s racism to demonize and exterminate black people. We will survive because God is with us. We will survive and the world will change. Empires, conquerors and oppressors fall, rot and die and the world continues to turn. Another favorite song is The Canticle of the Turning, a modern take on the Virgin’s hymn, The Magnificat. Mary’s response to threat of death she was under as an unwed pregnant girl in a society that policed women’s bodies and sexuality with lethal violence was to look back at how her people made it over because God was with them. Mary looked back to one of the Mothers of her faith, Hannah who would be known as a prophet in Judaism – perhaps she was by then – Hannah for whom tradition teaches Mary’s own mother was named. Hannah sang that God is a World-Turner (using the imperfect signaling future or even present action). Mary sang that Hannah’s prophecy was true (using the past tense). The empires that occupied Hannah’s Israel were long gone. Mary’s Song survived the empire that oppressed her and executed her son. Finally (but perhaps not finally! ), Immanu-El is with us in death and beyond death, transforming death into life. The violence of that first Christmas, and of this one, those between and those to come will never have the last word because God is Immanu-El. God is with us. We will survive. We will thrive. And we will turn this world around. The fires of your justice burn in us and will not be extinguished. With you we proclaim that our black lives are sacred. And this crucifying, lynching world does not have the last word. It is Christmas and you are Immanu-El. God is with us. If you cannot be merry or happy this Christmas, be blessed. Blessed Christmas. This entry was posted on 24 December 2014. 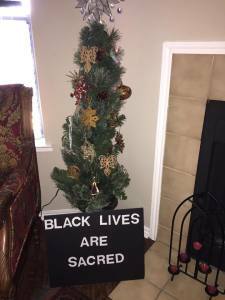 It was filed under blog and was tagged with black lives matter, Christmas, Eric Garner, Ferguson MO, Mike Brown, racism, Virgin Mary.